This page lists a series of guides centred around specific topics. For each topic we will be offering our current thinking about how we think particular things work. This is a sort of “How To” section. Hence the page title. Like the use of Bach Flower Remedies the concept of energising water has taken on further resonance (excuse the pun) by the work of Professor Masaru Emoto, whose work appears to demonstrate not only the power of water to retain or remember that which is has experienced, but also its ability to be shaped by such seemingly intangible effects as emotion, and even thought. In this first How To, Kal talks about a method of energising water using the focusing and vibrational power of crystals. I have a distinction. This is a personal distinction, which like personal truths are un-assailable and un-persuade-able (i.e. you can’t use them as arguments to persuade anyone else). The distinction is this, that “things” don’t gain or lose energy, rather they change frequency or vibration of their energies. So, case in point, the title of this post could very well have been how to change the energy frequency of water. Note : The components specified below are entirely personal so you should dowse for your own specific requirements. Crystals – 14 of them. That is probably the most I have used. They were 5 citrines, 5 carnelians, 2 clear quartz, and 2 rose quartz. Dowse to find an appropriate place and lay the crystals in accordance with where the rods say. I found a place in my back garden and placed each crystal in accordance with how the rods suggested. The eventual pattern was a spiral (no surprise). But then I dowsed as to where to put the water and the rods said to put the water at the end of the carnelian/citrine chain. Citrine – Carnelian – Citrine – Carnelian – Citrine – Carnelian – Citrine – Carnelian -Citrine – Carnelian – Water – Rose Quartz – Rose Quartz – Clear Quartz – Clear Quartz. I would love to get hold of the equipment Emoto uses to create and look at water crystals – just to see what the effects of this was. But the rods said that the water was “energised” and that I should drink it right away. I did drink it. It tasted warm but not anything different than warm water. Whilst I was conducting this experiment, my intuition was kicking in with ideas like, why aren’t you asking the plants to help, or your home energies or … so I will look at examining that aspect next time too. Another idea I had is to measure pre- and post-treatment blood sugar levels. Also using a control. Note though, I am not turning this into any kind of repeatable science. I only want to see if it does anything to “my” blood sugar levels. This post, indeed this website, doesn’t represent any kind of healing, medical advice or anything like that. Indeed I encourage you to take all you read on here as the product of imagination and intent. So don’t sue us because we haven’t got anything you want. One of the aspects of energy work, or natural magick, that I least wanted to consider I needed is protection. When I started out I was under the impression that protection was slightly paranoid, and only really necessary if the person or people involved were not centred and balanced enough, and therefore would be likely to draw the opposing energy forces towards them. In such a circumstance I could see that protection might be necessary. Rather pompously I felt that I was so centred that nothing untoward would happen to me. I was wrong. Whilst I still hold with my original theory to a certain extent – that people on the extremes of the energetic spectrum DO attract the opposing energy forces – there are some forces that simply overwhelm and enclose the druid or light-worker and without protection one is simply going to get swamped. It’s the old King Canute concept – just because you are righteous doesn’t mean that you can hold back the tidal wave of some energy fields. Imagination – the mind is used to invoke your personal energy field, or to draw energy from elsewhere to create a form of shell or bubble around yourself. This shell can then be sealed from external incoming energies in order to barricade yourself from their effects. 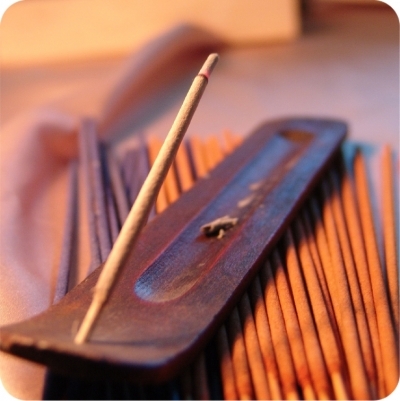 Incense – the space within which you are working can be cleared by planting incense around the boundary of that space, and the correct scent will clear the inner space and can prevent external entities from entering. Crystals – the right kind of crystals can be placed around you while you work and this will have the same effect as the imaginative approach, but with the added benefit that it is self-sustaining, requiring no further consideration by the druid. I have used, and still do use, all of these methods depending on the circumstances. They each have their benefits and difficulties. The most generally useful is the imaginative approach because no “added extras” or required, making it a suitable thing to do anywhere at any time. However, you often need your full concentration and energies to be focused elsewhere and I find that if I need to sustain an imaginative protective shell then at some point after creating it I need to re-visit it to check it, re-energise it, or bolster it. Note: some animals such as cats are completely immune to the effects of this protective shell and will ignore it. Some people say they do not need to do this. Well and good for them, but I don’t find that to be the case. Therefore I tend to use an imaginative protection shell when I need a quick protection for a short duration, and one which can be set up rapidly, and for any purpose. You could, if you had one, call upon some form of spirit guide or guardian to offer you protection while you worked. I have done this with trees too and it can work, but these other entities are often difficult to contact (unless you have a relationship with one already) and their intervention is not guaranteed. This is the type of protection I use most often when visiting sacred sites or other outdoor spaces. The incense clears the inner space of any unwanted energy, it forms a physical circle within which to work, and it has the added benefit that animals can smell the strange aroma and tend to stay away from your work space.The tricky thing with incense is that you have to find the right incense for the job. Not all varieties or aromas have the same qualities. Some will work, others won’t, and unless you are a dowser or have done a lot of research into the subject (or you have access to some other divinatory knowledge) then you might choose the wrong incense for the job you need. These days I take with me an assortment of at least three, often more, types of incense and then dowse which will be most effective. Note: I have already dowsed hundreds of types and scents in order to find these three or four types that are usable by me. So, a lot of work is involved up front, but then the actual use is easy. Providing you can get the buggers lit in a gale!! Which leaves us with crystal protection. By far the most robust, least distracting and strongest of the three forms of protection, in my experience. Whenever I use crystals I can place them at the appropriate places and then forget about them. Their placement and formation alone will energise them. No mental influence is required on my part either – I don’t even need to tell them what they should do. If I have already gathered the right types of crystals for the purpose then I can simply put them into the correct formation anywhere and they will do the job they are “programmed”…no, more “destined” to do because of the inter-relationships between the way that the crystals transpose their surrounding energies. Of course, the difficulty is getting a set of crystals suitable for the purpose before hand and making sure you have them with you when you need them. 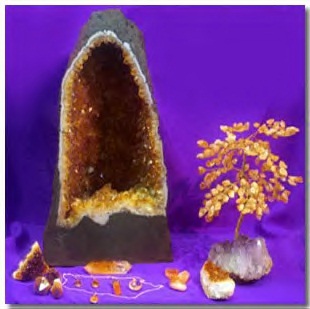 You may have a book such as The Crystal Bible which contains a great deal of reference material about the purposes and uses of many types of crystals. It won’t help you. That’s not fair – it may help you – but it won’t give you what YOU need. It has been written to describe the general characteristics of crystals, not their individual qualities. When you work with crystals you are working with them and they are working with you. You work together to achieve your aims. Despite what I have said about being able to set them and forget them, in order to get to that point you need to go through a process of choosing the right crystals FOR YOU, and FOR THE PURPOSE. I’m not going to dictate how you find that information out, but we’re a dowsing and druidry blog here – you work out how I did it!!! As an example I will explain the constitution of my own protection crystal set, how I came by the crystals, and what my protection layout looks like in action. I did not pick these crystals because I had read about those properties. I was walking by a crystal shop in Chester that I had never seen before and I wandered in. I walked straight over to these crystals and I bought two immediately. No thought, no knowledge. Later, when I dowsed what I could use them for I got a positive response when I asked about protection. Thus, they became part of my protection set. That is the only reason they are there – not because anyone or anything told me it was so, but because I picked them out for myself. Again, I went through the same process with these crystals too not knowing what they were supposed to be for, but dowsing what I could use them for. This is the method I recommend because different people will have different affinities and uses for crystals. In this instance it just so happens that their general properties are also the properties that I use them for. The quartz crystal was another one that I acquired at the Isle of Wight, except in this case it was given to me. I seem to acquire quartz crystals as gifts, don’t ask me why! The quartz serves the purpose of focusing the energies of the four other crystals and holding their energy output together – it is the binding that keeps the formation’s energies flowing, and keep them working together for the same purpose. It is the crystal that maintains the integrity of the layout. To find the formation again I used the dowsing rods. Once I knew that I would need the two agate crystals the two tourmalines, and I felt that a quartz crystal was right for the centre (I frequently hold a quartz crystal while meditating to bring focus to the energies around me) – then I had my five crystals. It could have been seven, or two, but it was five for me. Now I needed to know how I should best place them to form a protection around me. I found a flat wide area clear of obstructions and asked the dowsing rods, stone by stone, where I should place the crystals for the best protection effect. One by one they were placed and then I stood back and looked. Wow! It made a kind of kite shape. I was pleased at its regularity – this was something that I would remember and could easily reproduce, I knew. An interesting extra point to note is that the formation was not aligned to the flags on the ground where I had placed them – they were at an angle. On an intuitive hunch I got my star identification application out and looked to see which major star was in that area – the layout pointed directly at Arcturus – Arthur’s star, one of the brightest stars in the sky. I felt this was not a coincidence, but I haven’t yet made use of that knowledge. So, you find yourself in a situation where you feel like you need some protection. You have your crystals layout set with you. How do you use it? Well , this is the easy bit. You simply place the crystals around you in the format that you have been shown. I hold the central crystal simply because that I feel is the focal point of the layout and I want the protective energies focused on me. Nothing else is required – the crystals are already programmed to do their job and I only need to not disturb them. When I have finished I simply remove them one by one. That’s it. Easy! I hope you will be inspired to create your own crystal layout for whatever purpose you need, but I would recommend starting with a protection layout first, especially if you go to new places often. I recently moved to Barnstaple though an extraordinary set of circumstances and was ensconced in a room, though I had the run of the house too. I had already dowsed to confirm that the place was suitable for me to stay in (although the signs were too obvious anyway). A month or so in and I was wondering if I could create a “useful” power center in my room. So, I came up with a general method based upon my experiences of creating a power centre suitable for my purposes in this new place. I deliberated for a few days as to the why’s and wherefores and realised that (as with our sacred site visits) an objective or purpose must be the first thing on the agenda. Thus I needed a purpose for this power center. As I was still feeling home-less and un-grounded from having sold my home and given most of my possessions away I thought that it would be great to have a grounding, feel at home energy in my room. Note: Be cognizant of other people. Thus I also added to my intent that the new energy center be created in such a way as to not reflect negatively on others in the house or nearby. Before I turned my hand to creation I decided to map out the current energies in my room and the house as well. There weren’t many I have to say. The house is a terraced with cemented gardens back and front. There were no plants in it and until I moved in the landlady is only there a few days a month. So interms of living energies in the house, they were scarce. In my short investigation I found three female energies lines and two male ones flowing around the home. In my room there was one orphan male energy line that flowed across the room from a off-center point out of the door. Many days later I realised that this male energy spot was where the winter Sun came in through the window. I asked the rods if I could utilise any of these and the response was to shape the male one and bring in one of the female lines. Keeping my intention in mind I asked where the power center should be located and was surprised to find it off center of the room in a rather curious dip in the room (which I realised was due to the floor actually being about 1/2 an inch lower there). I also dowsed to see if I needed crystals, incense and candles. I asked whether anything else was required and got a Yes. Since I couldn’t think what I asked whether it was in the room? Yes. I was taken to my Tarot deck and I eventually selected one by dividing them into two until I was left with one card. Now we have what we want, its time to find out where to place it all. 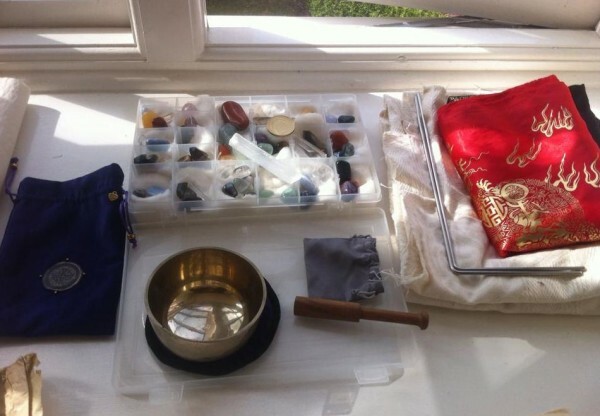 I dowsed to find the places for each of the items and they were around the room, except the clear quartz, that went where the power center would be and the Tarot card which oddly went outside my room door. I would show you a picture, but I believe that the layout is so personal to me and my environment that duplicating it would be useless. Light the candles and incense. Dowse for a place to be to do the ceremony, which happened to be on my bed, where my head normally is. And then to “energise” the grid with a visualisation. This I felt took about 15 minutes (a phenomenal time) and I had to keep focusing on the visualisation (almost as if I was stamping it). I spent a few minutes checking that all had worked in accordance with my intent, it had. The energy was flowing out of the power center, it was a male energy and it flowed around the room once and then out of the door. A female energy line flowed into the room and onto my bed, which was a surprise. Apparently if I get a couple of plants and add them to my room the positive energy would increase 8 fold! Wow and yes I now have two plants. Also I noted that the power center would be energised by my personal energy and so as long as I “live” here the power center will be there. Sirius is one of the brightest stars in the sky, usually clearly visible without binoculars or a telescope if city lights aren’t interfering. What we call Sirius is actually two stars, Sirius A and Sirius B; however, Sirius B so small that it is visually upstaged by Sirius A. The simplest way to find Sirius is to find the Orion constellation and use the three ‘belt’ stars as a signpost. In the Northern Hemisphere, winter nights after 9 p.m. are among the best times to look for Sirius using Orion’s Belt as a guide. In late winter/early spring, look due south for the bright star itself. Look toward the south-southeast to find Sirius from Winter to mid-Spring in the Northern Hemisphere. Locate the constellation of Orion, particularly the three stars of Orion’s belt. Focus in on the leftmost star of the belt. Hold your right arm out straight with the right edge of your fist adjacent to where you see the leftmost star. Rotate your fist diagonally so it continues the left-and-downward slant of the belt. According to Space.com, one fist equals about 10 degrees of sky when held out at arm’s length. Place your left fist next to your right, also diagonally. 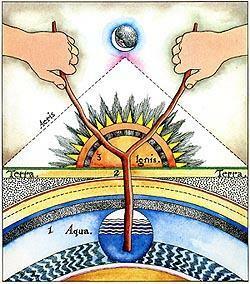 Sirius should be at the left edge of your left fist. Map dowsing is one of those subjects that divides even the most devout dowser. Even though dowsing as a practise involves the location of invisible forces, many dowsers will turn to science to justify their work on a very physical level. When it comes to map dowsing, however, there really is no physical element to it, and the dowser is removed from the object of the dowsing. For many dowsers this is a step too far, and a move into the world of esotericism. So it was for us when we began dowsing, but after years of familiarisation and investigation we have found that many of the useful tools that we initially dismissed have proven themselves over time. Now, we both firmly endorse map dowsing as a method of locating your intended target – even if we can’t explain it fully! It works. 1. Set a target in your mind, and create a question to ask the divining rods or pendulum that will find the target. 2. Using a single dowsing rod ask to be shown the location of the target. The rod will point in a single direction. You can check the accuracy of this by moving yourself left and right. If the rods stay fixed on the location as you move then you have the right location.You can introduce your compass at this point if you want an exact bearing, but a general sense of which cardinal direction was indicated should suffice at this time. Now that you have a direction, you will need a distance. 3. Ask the rods how far away the target location is. I use a scale of 0-10, 11-20, 21-30 miles, etc. Once yuu have the range you can begin to narrow it down if you wish, but at this stage you should have enough information to turn to a map or an atlas at this point. To narrow down your target you will need to know your starting point – where are you now? Then you will only have to identify an approximate location that is, for example, 40 miles to the North-East of you (or whatever direction and distance the dowsing indicated). Using your map or atlas you should be able to identify the general area on the map that relates to your target location. 4. Confirm with the dowsing that your location is in the part of the map that you are looking at. 5. Using the Map’s grid system read out the column (longitude) until you get a positive response ( you may get responses for more than one which may indicate that the target spans two consecutive grid locations). Do the same for the rows (latitude) and you now have a cross-referenced grid square. Depending on the scale of your map you should be within a reasonably small area now. For an atlas this may be several miles, but for a small-scale map you might be looking at only a few hundred feet square. My preference at this stage is to visit the area and use my intuition and follow signs to lead me to the exact target. Sometimes the target does not appear on maps, and doing the fine-tuning location using a map can lead to a false target, so I recommend you visit the location and take it from there. You can even use the dowsing rods to take you to the exact location once you are in the general area. This is only one method I have fount to map dowse, but it has proved to be incredible reliable and accurate for me. I hope the same is true for you on your journeys. In this How To I will discuss my experiences of how to speak to a tree. Speaking with trees is an incredible experience. Whether you learn something useful or not trees are a wonderful sentient species who can be a treasure trove of valuable experience and helpful advice on all manner of subjects, particularly subjects of interest to druids such as energy, ecology and Nature’s processes. They also have a wealth of historical localised information due to being in one position for many years. Of course, you need to be prepared for how ‘other people’ view people who try to talk to trees. You may be branded as a ‘nutter’ and ostracised accordingly. However, the brave and the beautiful should press on because the rewards far outweigh the rebuke. I usually go for older looking trees, but young ones can also be friendly. Does it matter which types of tree? Yes. Some species are more friendly than others, but individual trees are as different as individual humans, so this is not much of a guide. When you begin to extend your knowledge of trees you will also find that they pass information between their same species, and so your good relationships with one type of tree will hold you in good stead for meeting another of the same species. BEECH – are good teachers and usually kind and pleasant. A good choice for beginners. BIRCH – are the easiest to deal with. I would recommend finding a birch tree to start working with if this is your first contact, but don’t expect much ‘valuable information’ or an astonishing experience. They’re easy to deal with because they’re a ‘young’ species generally. OAK – can be difficult and grumpy. Best avoided if this is your first contact. SYCAMORE – just seemingly difficult to contact. I don’t know why. It may be a personal thing. HAWTHORN – can be scary. Like Holly and Yew they are the guardians of the dark places, and this can freak some people out. YEW – if properly approached they are the most interesting of all trees, but like Hawthorn they can send the beginner into a real spin, so I wouldn’t advise you try one until you’re ready for the experience. Make sure it’s a tree in a quiet place – you don’t want to be disturbed. Try to find one away from noise pollution such as roads or the paths of planes. Try to find the edge of the tree’s aura either by dowsing it, or by feeling for it. You should feel a slight change in air pressure or temperature. Maybe your hands of arms will tingle slightly. If you can dowse for it then this is the easiest way. If you can’t feel it or dowse for it, then a general rule of thumb is to use the spread of the tree’s canopy as a guide to the size of its aura. This is not always true, but it’s a good starting point, and the tree shouldn’t mind if your intentions are honourable. The key is respect. You should stand at the edge of the tree’s ‘space’ in respectful silence. When you feel the time is right you may begin to formulate your thoughts. I usually begin by introducing myself. I tell the tree my name, then my druid name, and my intentions. Then I ask if I may enter into the tree’s aura. This is the important part of the relationship! Don’t take this bit personally. If a tree doesn’t want you to come closer then you simply have to respect this and walk away. Who knows why it might happen? But when it does, please be good and take the hint. If you get an acceptance from the tree you may feel that you are slightly ‘pulled’ towards it. If you get a rejection you may feel a ‘push’ in your stomach, or feel bad vibes, or just feel a bit queasy. You may just think a thought about not being wanted, and you should walk away at that point. Try again with another tree. If you get accepted then you can approach the tree and sit near to it, or touch its trunk. Contact is good. This is the core of the contact experience. This is where you actually learn something about trees. If you are used to dowsing or meditating then you already have the mindset you need to begin to commune with a tree. If you are new to this then I will do my best to describe the way you need to interact with this living organism. I usually sit beneath the tree touching it’s roots or the base of its trunk. Once in contact I go into a light trance, letting all my thoughts go until my mind is clear. Once I am relaxed and calm, my mind clear, I direct my thoughts downwards to meet the roots of the tree. Then I extend my thoughts like tendrils of energy upwards to touch the branches of the tree. If everything feels good then I try to place my attention into the very core of the tree. At that point I wait to see if there is any response. If I don’t get any voice or vision then I begin to formulate a conversation. Just as though you were having a talk with a friend, but one who you really respected. I ask polite questions of the tree and calmly and mindlessly wait for a response. Sometimes I get voices (usually a deep voice) that answers my questions. Sometimes I get given pictures in my mind to explain concepts or give me ideas. When you feel you have learned enough, or you simply want to stop, then open your eyes and thank the tree for its help. You should retract any energy ‘tendrils’ that you have extended into the tree’s roots or branches, and gather your energy back into yourself. Then, life is back to normal! And you have had your first tree communion. If you only got a faint whisper or nothing at all then keep trying with the same tree, or tree a different species. Trees have energy fluctuations just like we do, and Summer months may be better than Winter months for getting a response. Okay, See, that was an interrupt to the process. The questions that follow are to determine the right time. Such as when is a good time? 1pm, 2pm, 3pm etc. You have to remember that energy is affected by all sorts of stuff. Stars, weather, other people in the home. But your intuition is capable of looking at the holistic picture and determining an answer. Where do I need to place the bowl? This will take you to the most innocuous place in the room. Not the centre, nor any (energetically) interesting place. Place the bowl on discovered spot. How many energy strands do I need to gather into the bowl? 1, 2, 3, 4. Ah okay, four. (for you it might be different. To do this you find the end point of where you need to collect it. Stand on that point and mentally anchor yourself to the energy that is emanating. One you have done this (ask the rods) you ask the rods to take you back to the bowl on a path that will collect the energy strand. This will take you along a wavy path back to the bowl and swirl (spiral) around it. Do this the number of times that you dowsed for (in my instance 4). Strike the bowl once – loud and clear. As the sound reverberates around the room you can ask (for curiosities sake) to follow the energy from it. I found huge spirals of energy emanating from the bowl. Finally, you ask whether all is done and the room is cleansed. Job done. All clear!